Providing suitable school speech topics for children is often a real challenge. As their teachers or parents, we want stimulating, interesting subjects for them to work with. However we also need them to be aligned with their age group. If we make the topics too adult we risk pushing them into areas they're too young to cope with. If we make them too simplistic we run the risk of minimizing or patronizing their growing sense of awareness. As in everything, we need to find the balance. The speech topic ideas below worked well for me with middle-school children, aged between 11 years to approximately 14 years. 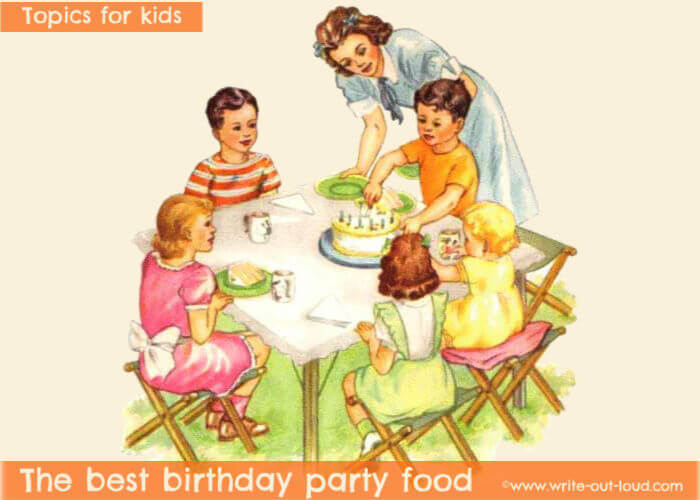 Some are more suitable for an imaginative child and others for a practical, factual child. The topic you select will also depend on the objective or goal for the speech. 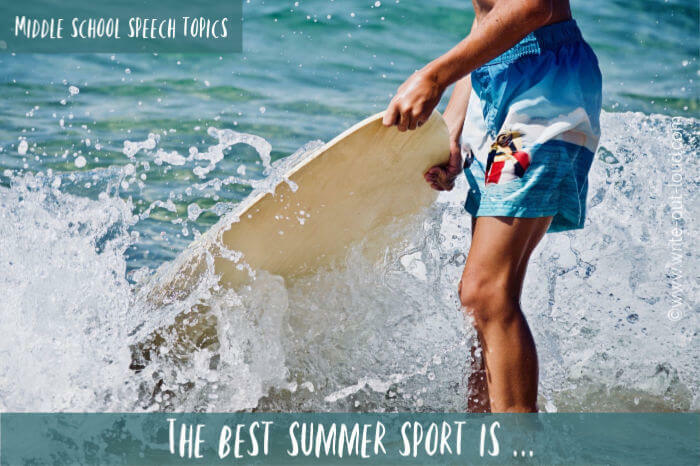 And if by small chance you reach the end of the page and no speech idea has leaped out to grab you, there's another 50+ elocution topics for kids waiting here. 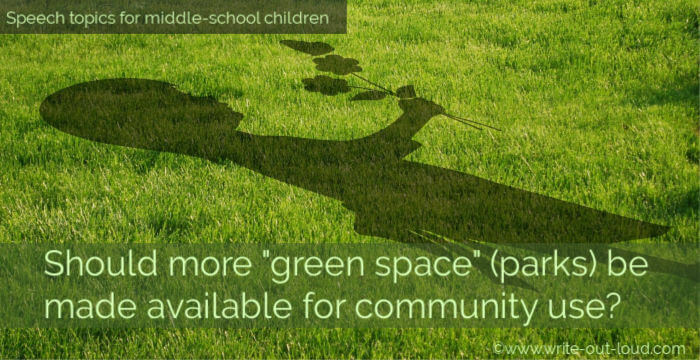 Should more 'green' space (parks) be set aside for community use? Should large cars be banned? 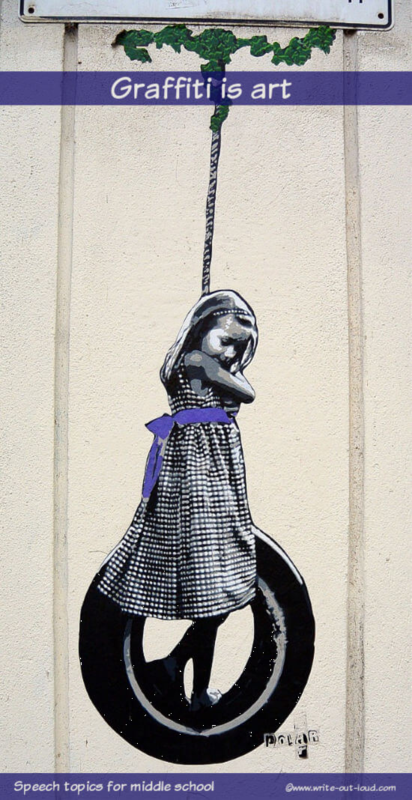 What rights should a child have and why? Does watching violent TV programs make a child think violence is acceptable? Do certain types of pop music teach the wrong values? Should students have the right to choose what school they go to? Should students have a greater say in what classes/subjects they study? The school leaving age should be abolished. Clothes and being fashionable are way too important. Parents should monitor how we use the internet. Explain a cultural festival or practice of significance to you that others may not know about or appreciate. Why are film stars so popular? Who is your screen hero and why? Who is your favorite book/cartoon character and why? What inspires you about dance/art/drama/music or film? If you were to write a book for your age group to read what would it be about? 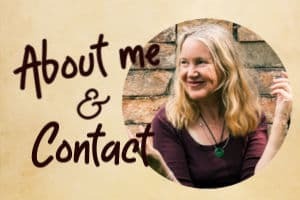 Strange facts about artists, dancers, musicians etc. A day in my life as a ... table, pencil, car, potato, bicycle, blackboard, window, ball, or anything else! What I think of people from the viewpoint of a tree in the school grounds. 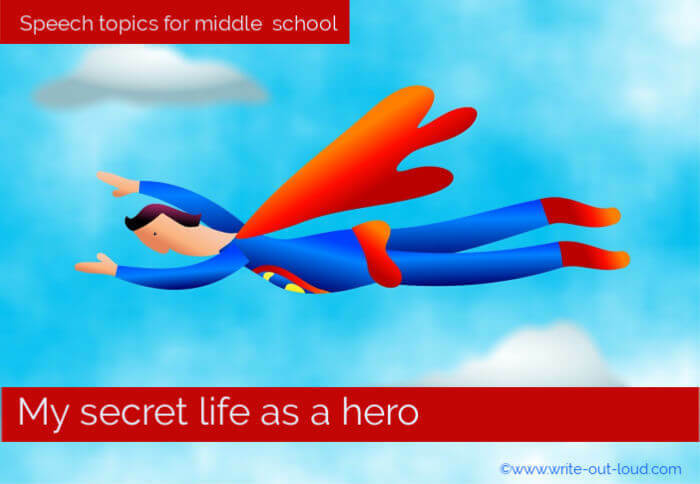 My secret life as a hero. Weird and wonderful words - what do they mean? How to write using invisible ink. My secret code...How to invent and use a coded language. Explain the game of checkers/drafts/chess. Extreme sports are dangerously exciting. Everybody should learn to play a team sport. Sport should not be compulsory. In sport, the rules are there to protect the players. Winning is not so important as participating. How I learnt to cook. My favorite Christmas (celebration) food. Table manners ...Are they important? Do Americans eat too much? 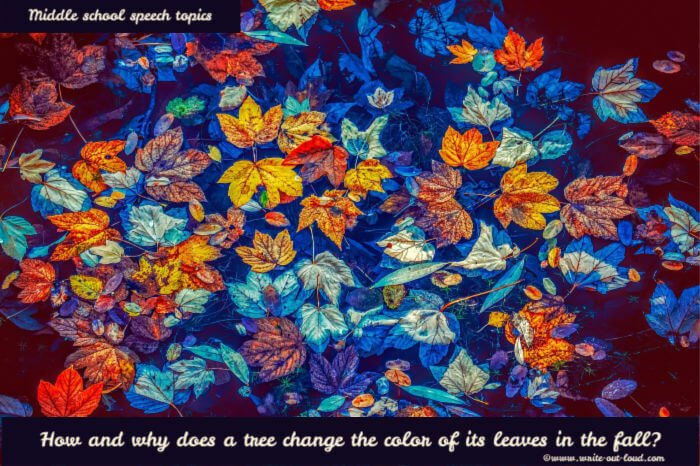 How and why does a tree change the color of its leaves in the fall? Why do we have day and night time? How come the earth goes round and round? Explain how snow is formed. Show the patterns formed in frost. How does a rainbow work? Research strange plants - carnivorous etc. What and where are the biggest trees in the world? How and why should we conserve nature? 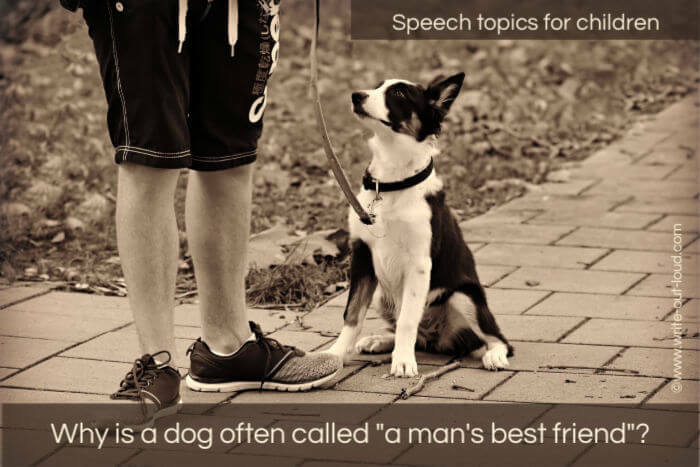 Why is a dog often called a "man's best friend"? Are there bad dogs or bad dog owners? How has the horse been used by man throughout history? What animal makes a great pet and why? Do animals really think or do we only think they do? Tell an inspiring true story about an animal. Are zoos good places and why? Find out about conserving animals/birds/fish in your local area. Retell a myth or legend about an animal/fish/bird. Research strange or rare animals/birds or fish. Interview a pet shop owner to find out what are the most popular pets. What do you think about restrictions around fishing? What is the symbolism associated with some animals/birds or fish? For example a lion stands for courage or strength. As you can see the variations of school speech topics for children are vast! 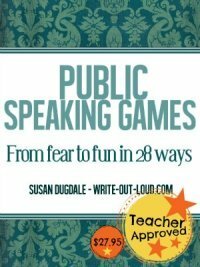 If you've found nothing here to ignite your imagination do try this page of 50+ elocution topics for kids. If you're here looking for a topic for your own child, go through both pages with them: this one and the other. Suggest other possibilities and adaptions of the topics as you go. You'll need to find a subject they genuinely care about and it's best if the final decision is made by them! Were you looking for information to help you write a speech for children rather than speech topics for them to use? 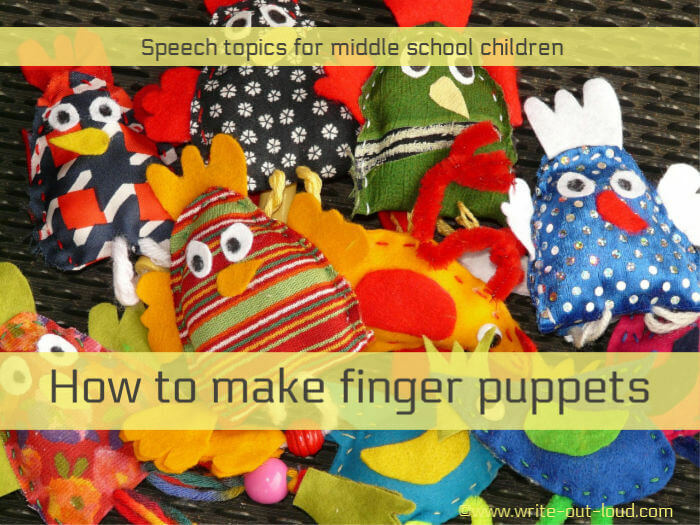 If so, you'll find this page How to write a speech for kids useful.